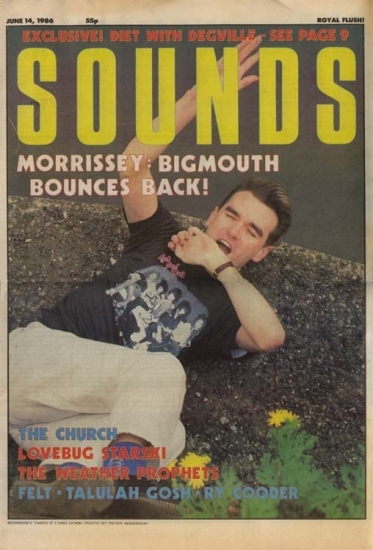 Lengthy interview with Morrissey in the June 14, 1986 issue of Sounds. Paradise is Morrissey's Manchester where he's looking for a deep gutter to lie in. But as he dismantles British society and declares 'The Queen Is Dead', at least he shows an hysterical sense of humour to GLYN BROWN. Acres of smiles by PETER ANDERSON. DO YOU want to be an unhappy person? "No, but I do feel that in an absolutely perverted and unacceptable way I've benefitted, really benefitted, from being quite a dour character. I've benefitted. It's like the wheelchair celebrity syndrome. "The other thing is, I can predict, without fail, if someone is going to turn out evil and nasty. When I think a mood or a temperament is wrong, something awful happens. Although I don't know if it's the force of my willpower." "Could I be that gifted? Could we stand it if I was that gifted?" We couldn't stand it if you weren't. "Oh! Oh, aha ha ha ha HA! No, no, the world would perish! The world would perish! Nobody's ready for that yet!" THIS IS what they said. Take a train to Manchester. Interview someone who's so bored with interviews he went home to that complicated city to avoid them. 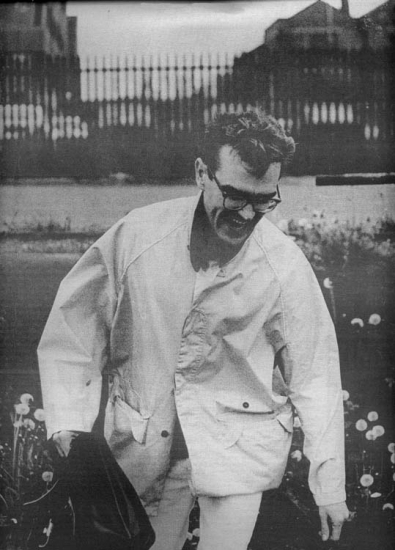 On a day when I must stand motionless for what I know is years on demolition sites and deserted Manchester docks while Steven Morrissey has his photograph taken, God has sent the coldest June day of my life. The greyness is set to the threnody of the wind and the howl of the juggernauts on the Trafford Road bridge. I try to get my jacket over as much of my body as possible. Is it always like this? I ask Morrissey. "Oh yes, yes. Always. Always the same." MANCHESTER IS a dark, dark place, and it seems fitting. When Morrissey ("spelt right, for the first time in rock history!") set drama to Johnny Marr's Smith melodies, it seemed no one had felt sadness before. It seemed so strong and so right, and then it seemed sadder; and for a sudden, shocking amount of time, it almost seemed - say it - too much. He did think of suicide, he hinted. By this time we were almost in a mood to laugh about it. Come on. Snap out of this. (It was all forgotten how that sadness had almost given everyone - you too, I bet - a song from the bulky repertoire to clutch and strangle with possessiveness.) The Smiths? Oh, Leonard Cohen. And then a song called 'Bigmouth Strikes Again' bounced about, and the sadness (still there) had had enough, too. It laughed - just threw back its head with a sweating attack of the giggles and gulped, "sweetness, sweetness I was only joking/when I said I'd like to smash every tooth in your head". And there follows an album - 'The Queen Is Dead' - of such audacity, such wit and black humour, I expect you to sit back open-mouthed. You always do that when I write, though, don't you? WHAT WE were searching for here in Manchester this afternoon was a gutter. A gutter, yes. It had to be large, and it had to have a grille on the front, you know the sort. And it needed to be in a relatively quiet area. Because Morrissey wanted to lie in it. "I know where there are some good ones, but it's a very rough part of town. I see myself face down almost. My head in a puddle, hopefully. What a shame it's not really raining." We looked. We all tried, but we failed. Some gutters came close though. Later, when we have washed the bits of rubble and so on from our now very street-cred clothes, we can mull over our afternoon. Gutters? "Oh, it was all artistic nonsense, really. Being here in Manchester and lying in the gutter, that's how I always felt here, I felt - there's a very famous Oscar Wilde quote, We are in the gutter but we are looking at the stars, we... we may be like this, but we really feel... this." The man before me seems ready to lay bare his soul. He'd like to be his icon, James Dean; that much - from his spiky quiff to his now muddied stone-coloured Harrington - seems clear. But he is not, and so some other device must lend him romance. And of course, he's not cool enough to be James Dean. Dean would drink, and brawl, and fall asleep with his head in his food. Morrissey will never be neurosis-free enough for that. He, too, is a misunderstood outcast, but it's because he is too articulate, too studious, too vain and too eager to be friends. These are all the wrong reasons. What Morrissey wants to do now is entertain me and come over well on tape. He's in a winning situation, and at last - with this profession - he's found the place where his strong suit makes him the best. And, behind the fascination any nervousness lends its sufferer - oh, admit it - I think this owl-like man wants me to like him. And I can't help myself. "They're very hard. There is no money, and that makes it very vicious, very difficult." You sound sympathetic. I had the idea you were antagonistic. "Well, it's very upsetting, because I'm torn between the ties of my roots, which are very binding, and a hatred, because I've spent so many unhappy years here. "It's a total love/hate relationship, which is very strangulating and I can't really see any sense in it. Today, when we sat in those bleak patches and we gazed across at what was the Salford skyline, I felt a curious glow which I knew nobody else was feeling, and I thought that to relate that thing would just bore everybody rigid." "In a very twisted way, yes. Those awful factories where... those repressive Dickensian buildings - I can see so much beauty in them." Looks at my face. "I know it's a strain if you come from beyond the borough." 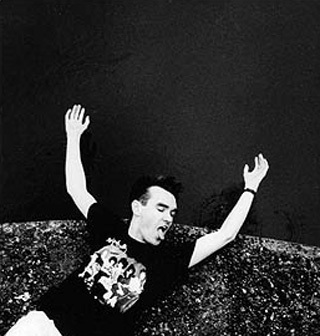 At this point, Morrissey surprises me by suddenly collapsing with laughter. And (surprise for you, too?) this sets the tone of the talk. We laugh and laugh. That's the theme, and my memory of it, wild giggling at everything. I truly laughed more loudly (possible?) with this man than I've done in ages. And I'm a person who laughs. You've got "Fear of Manchester" scratched into the playout area on the LP. "Yes." This is a long drawn-out and remorseful 'yes'. "It's like, when you suddenly become frightened by something, you can so easily become obsessed with it. Like skating near the edge, it's..."
"Are we on the same planet?" "Oh, how can I explain this?" An edge of hysteria, which will become a familiar sound to both of us during our tete-a-tete, has got into the room. "It's like when your best friend becomes your worst enemy. It frightens me, and I can't get rid of it or escape it. I find that I'm sitting in Los Angeles talking about certain nonsensical Mancunian landmarks! It all becomes so ridiculous, and I can quite see why it would bore someone else rigid." It's like a love affair that's gone sour but you can't get it out of your system? "Oh, yes! It is, exactly like that, and that's the bore of the situation." Look, why do you keep saying it's so boring? "Because I know that if somebody talked to me about - no, I won't mention any landmarks..."
A lot of silly giggling follows. 'THE QUEEN Is Dead' is a good phrase, isn't it? "Yes, it is. There's an elastic power which can stretch to almost anything." "The very obvious reference, I think, which is drowning the monarchy, or whatever." Be reasonable, surely Mrs Thatcher would come first? "Yes, but I don't think I've neglected her in the past. Though there was a working title, 'Margaret On The Guillotine', but that was ditched because... well, I can't say why." So what irritates you most about the monarchy? "Well, that they say nothing, they do nothing in the face of impending world disasters - disaster without end, and they have no viewpoint. "I mean, can you remember any particular member of the royal family making a really, truly sensible and worthwhile statement over the entire history of their existence?" I'm still racking my brains when the toast and tea arrives, and as he eats Morrissey interviews me quickly and thoroughly. You know, you should have been a journalist. You make me feel incapable. "I was too nice to be a truly - excuse me... burps... whoops - successful journalist. I tried." "I did. But I was far too polite to be successful." Morrissey waves an arm airily. "Oh, I had scraps in... er ... in certain papers, yes. He says. Ha ha ha!" Hysteria's come back in for some tea, did you notice? I CAN'T quite decide if Morrissey has charisma. I think he has. I'm near, very near to being convinced of it. It's not immediate, though. But there's something - isn't there? - that sets him apart. Or perhaps that's the disability of it. "No, good heavens, no! Never glamorous, never, never glamorous. From these roots - going back to the dreaded thing - it's easy to see my position as being glamorous, but never physically. "No, but many people who are not glamorous radiate something, and that's attractive. It's from inside. It's strange how many people have an outside that contradicts the inside. It's like... well, I won't say what it's like." Alright, don't. But do you see your body as a liability, in that case? "Oh, there's many bits that have me waking up at night and howling for mercy!" "There are many bits I can't face, and we won't name them." Do you pretend they're not there? "Yes, but it becomes obvious I'm trying to hide something." "Of course they do, they say, Why are you trying to do that?" Morrissey replies in a voice shrieking up the register to a crescendo. "I say, What on earth are you talking about?" Alright, OK. Uh-huh. Let's have some tea. Ah - you must prize your thin... your slimness, though? Morrissey nods obediently, trying to please this giggler and loop-fruit who can't take a bit of her own neurotic behaviour when it comes from someone else. "I'm thin, but I stoop. I stoop. I do stoop. And I don't know why." "No, my idiosyncracies never make that much sense." So you have the reaction but not the problem? "Well, who knows? And - and I tend to genuflect when I meet people, which is an awful, humble thing." "I don't know why. And I always do it. I go home and I beat myself to death for doing it." You know you're doing it and you can't stop? "Yes! I can't stop doing it. I just automatically..."
"Yes. It's awful, it's dreadful. And there are other things. I don't like being touched. You know, if I'm in a club I can sense when people are working their way round and I know that they're going to touch me. People will actually grab me and run off." "Any bit they want to." Don't you want to smack them? At this point, Mr Morrissey is speaking quietly and earnestly again, and I feel very sorry about these trying people. HERE IS a man who says he has always felt old, and it could be no other way. The smile is somehow the smile an indulgent parent gives a frolicking child, the timbre of the voice betrays years of wearing experience, even though the songs themselves billow and froth with images of adolescent desires. Will The Smiths' vocalist ever feel he's at just the right age? That he and time are finally at peace? You've taken to wearing the hearing-aid again, I see. Do you need to wear it? "Yes, yes. I feel absolutely comfortable with it, it makes perfect sense. I mean, I don't need it for hearing. It's just relaxing in a foggy way." This senior citizen approach - doesn't it make you feel time's running out faster than is usual? "If one is happy, age is immaterial. But I... I get distressed about having to wait for that time to arrive." "Yes, it makes me very nervous. Like, when do you reach a point where you've read all the books you need to read, you've consumed all that you need to in order to make yourself an, inverted commas, 'interesting person', you've created your own allure - when does the time arrive when you can sit back and feel, Well, I have probably arrived, so take me, you know, or spit me out'. When do you think it will be? "Ah..." Morrissey looks at his hands, his feet, finally at me. "I can't really see it arriving, which is the biggest shock of recent years. I can't see it arriving. I just presume now that it never shall." "Yes, you need something to give you hope, though. Hope... Mmm, the light at the end of the tunnel. For me, it's still a case of finding the tunnel. So to speak." Comically raised eyebrows. Defuse it all with humour. Obligingly, I laugh. AFTER ALL, it is embarrassing to be honest and too serious, isn't it? Particularly for someone whose first concern seems to be to save us from the embarrassment he thinks he causes with every awkward move or phrase. Morrissey is cynically familiar with and therefore sensitive to pain. "I was walking through a park quite recently and suddenly a little girl ran past me - I suppose she was about six - and she was screaming; she was crying as she was running through the trees, and it was just so awful. It was probably not dreadfully serious, but I could imagine she just wanted to die and leave the earth." Children can't articulate. It's like being an animal. "Yes, it is. That's why I could never be a parent. I could never witness all those pains and the awfulness and loneliness and bleakness again. Parents just can't help at all. In fact, there's such a gulf between parents and small children it's ridiulous the system works at all, it's practically unnatural." SO TELL me (as they say in all the best flicks), do you like people? "Um. I... yes, I hate most people. And I don't want to, it's an awful way to be. But the human race gives me no comfort. I find myself turning to books and films for comfort still. It's repulsive." "Because one's life consists of people, not things. Most people's problem is having too many people in their life. With me, it's just the reverse." But maybe that's because you don't want them? Morrissey goes almost scarlet in the face as he wrestles internally for a suitable reply. "Mild coronary arrest," he mutters, "and you sit there giggling." Irritably: "Oh, what? You're not going to ask for a train ticket refund, are you?" Listen, I think you see women as fat, stupid people who want to trap men into being married. Don't you? An explosion of laughter gales around the tiny room. Mount St Helens quakes. Morrissey removes his glasses and in an infuriatingly exaggerated manner mops his eyes. He is almost dribbling. He hisses between gulps, "Aaah! I've been uncovered!" and this is apparantly so witty (I don't find it so) it sets him off again. Finally, "No, I certainly do not." Weak titter. "I mean, though, let's be honest, there are fat girls. You can't deny that." I reply - justifiably hurt by being laughed at, so by now pretty huffy - that perhaps I was silly enough to believe the lyrics. They are all about you, by the way? I said, Are they all about you? "Oh, I thought you said, I know all about you. I thought, My God, what's coming next? But yes, they are." So what about 'William, It Was Really Nothing'? How about that? "Oh. Oh yes. Yes. Probably yes. What was the question?" "I'm fascinated by women, and that's never been stated before. Misogyny I find impossible, impossible to... No, I'm fascinated by women to a silly degree. Tsk, if I use that word again..."
"Silly. If I use it again, I'll leave the room." SELF-CONSCIOUSNESS, in the true sense of the word. I thought I was the worst, I thought I was right up the front, in place number one. But it seems that seat was taken. "Oh, I'd love to forget about myself! To leap into a different body for a day. Because, being me... oh God, this sounds awful - and having to question - I think of Virginia Woolf, when she said everything she does, she has to question, has to ask who am I, why am I here, what have I done to deserve this, who are all these people? That's how I feel. It's awful. Is it a blessing, is it a burden? I don't know. It's so revolting." What could make you forget yourself? Morrissey mishears, but never mind. It's a roller-coaster ride to the end of the line. "No, you can't be someone else! You can't! You'd take everything you despise about your life and yourself with you. You'd turn around in a different country and you'd find everything was still there. Oh my God! I can just see the blood spilling off the pages of Sounds with this!" The phone shrills. I jump half a mile in the air and answer it to be told we've come to the end of the room time hire. Just tell me - what's the most important item in your life? "You'll hate me - it's The Smiths. That's all. And beyond that is a crevasse. Just a huuuuuuuuge drop." What happens when you all decide you no more want to do The Smiths? "We just go over the edge. Into the mystical wide ocean." I screw up my face. "Yes, you can! That's what I was imagining. Just sailing along in a huge bed - let the sea be your bed..." Morrissey's eyes go (craftily?) misty. Is this a real reverie or the perfectly planned end to a lovely feature? I don't mind. I like the idea. Finish up, Mr M.
"A massive, watery bed. That's what I can see..."
Reprinted WITHOUT PERMISSION for non-profit use only. Photos by Peter Anderson reproduced without permission.